I was at the ANSI IPM summit this week, and had the privilege to hear several industry leaders talk about the state of IPM. Dr. Mike Raupp from the University of Maryland was one of the speakers. Dr. Raupp informed us the US stands to lose over 8 billion ash trees to emerald ash borer. While this is tragic unto itself, something I hadn't thought of before was the effect on other species of plants and animals that have a symbiotic relationship with ash trees in the wild. Untold numbers of animals use ash trees as primary food sources and shelter. In a greater view there are untold more animals that rely on the 1st bunch for food, seed dispersal, germination, etc. So, what to do for these poor unfortunate creatures? The Manchurian ash (Fraxinus mandshurica) has a natural resistance to emerald ash borer, and is similar to our native ashes. 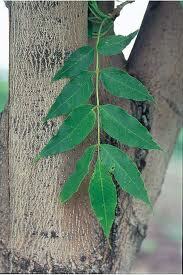 Would it be possible to begin replanting our imperiled ash forests with Manchurian ash? If it is, could we save numerous species of plants and animals from possible extinction, assuming this Asian ash species would be a suitable substitute for our native ash? Or would this exotic ash fall victim to a native pest our endemic ash has long since built resistance to? These are interesting questions, and play a role in the future of our landscapes, forestry, and conservation arboriculture. Manchurian ash, could you tell the difference.